A meningitis vaccine that has recently been rolled out in several African countries has reduced the incidence of the disease by 94 per cent in Chad after just a single dose per person, in what scientists say is a startling success for the new vaccine, called MenAfriVac. And the presence of the bacteria responsible for the disease in people’s throats – carriage prevalence – dropped by 98 per cent, according to the study published in The Lancet today. The research, based on an analysis of data from 1.8 million vaccinations in Chad, revealed that there were no cases of serogroup A meningococcal meningitis, the most dangerous strain of the disease, following vaccination. “This is one of the most dramatic outcomes from a public health intervention that I have seen,” said lead author Brian Greenwood. 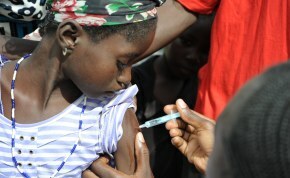 “There are now real prospects that the devastating effects of this infection in Africa can be prevented,” said Greenwood, a professor of clinical tropical medicine at the London School of Hygiene & Tropical Medicine, United Kingdom, which carried out the study together with the Centre de Support en Santé Internationale in Chad and other partners. Deadly epidemics of meningitis A occur regularly in Sub-Saharan Africa’s meningitis belt, a band of 21 countries stretching from Senegal in the west to Ethiopia in the east, where around 450 million people are at risk. Group A meningococcus accounts for an estimated 80 to 85 per cent of all cases across the belt, with the most affected countries being Burkina Faso, Chad, Ethiopia and Niger. If untreated, the disease – which mainly affects infants, children and young adults – kills half of those infected. In the new study, researchers compared the impact of Chad’s 2011 vaccination programme on meningitis incidence and carriage in three vaccinated areas with the results from the unvaccinated areas over the same period. When the 2012 epidemic seasons arrived, the incidence of meningitis of any type in the three vaccinated regions was 2.5 per 100,000 people, compared with 43.6 per 100,000 people in the unvaccinated areas. And there were no meningitis A cases in the vaccinated regions, compared with 59 in the unvaccinated regions. Carriage of the bacteria also dropped dramatically among vaccinated people, and even unvaccinated people – those too old or young to be vaccinated – showed no cases after their communities were vaccinated, suggesting that vaccination programmes substantially reduce carriage and transmission. Although mass vaccination campaigns in Burkina Faso, Mali and Niger had shown the vaccine to be safe and highly effective so far, “until now, it was not known definitively whether MenAfriVac had a major impact on the incidence of serogroup A epidemics and carriage”, according to Greenwood. The WHO says the vaccine has several advantages over existing vaccines, including: a higher and more long-lasting immune response; reducing the number of throat bacteria, and thus transmission; its expected long-term protection for those vaccinated, their family members and others who are exposed; and its lower than average price. The findings support the case that vaccination programmes should continue across the African meningitis belt, according to Greenwood. But he warns that continuing surveillance and further carriage studies in the belt will be needed to confirm the duration of protection provided by this vaccine. “This is an extremely encouraging sign for those countries that are yet to introduce the vaccine,” Jean-Marie Okwo-Bele, director of the WHO department of immunisation, vaccines and biologicals, said in a press release. The vaccine was developed by the Meningitis Vaccine Project, a partnership between the WHO and PATH (Program for Appropriate Technology in Health), with funding from the Bill & Melinda Gates Foundation. This entry was posted in Chad, MenAfriVac, Meningitis, World Health Organisation and tagged Africa, Bill & Malinda Gates Foundation, Child Deaths, Disability Aid Abroad, Global Health, International Disability NGO on September 12, 2013 by disabilityaidabroad.